The Agricultural Revolution had a huge effect on British, and indeed on world agriculture. The Revolution, which started in the 17th century with the invention of machines like the seed drill and the spinning jenny, saw appliances begin to replace human workers, and was essentially based on the invention of the differential gear – which allows a person to translate a specific amount of cyclically generated power from a vertical to a horizontal plane. A modern piece of agricultural machinery shares this transmission heritage from the first traction engines, which were the lineal descendants of portable agricultural engines used by farmers in the late 18th and early 19th centuries. The portable farm engine was dragged from location to location by a team of horses, at which point it would be fixed to the apparatus it was intended to drive. The power for hoeing and harvesting came from the engine itself, which used steam power to develop the traction needed to pull a long drive belt backwards and forwards across fields. Farm machines were attached to the drive belt, which pulled wheeled machines backwards and forwards across the land. The wheel and the modern traction engine (or tractor, as it is now known) are the reasons why agriculture was able to develop on the massive scale that it did. The wheel forms a central part of a differential gear setup, or transmission as well as allowing the tractor to move around under its own power. Gear cogs, after all, are wheels with teeth in them – and it is these teeth that allow rotary motion to turn through 90 degrees and power a horizontally lying axle or drive shaft. 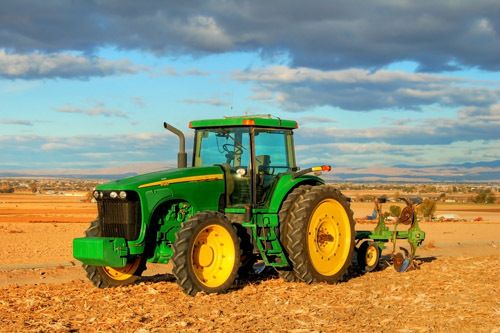 Nearly all modern farm equipment takes its power from the tractor – in the same way that historic farm equipment used to take its power from the portable traction engine, or the horse drawn traction engine. Whatever equipment is required to be used is plugged into the drive shaft of the tractor, which provides the rotary motion necessary for working the turning parts of the additional machine. The only exception to this rule is the combine harvester – which is kind of a cheat, as it’s really juts a tractor in a fancy suit anyway. The combine harvester uses the same principle – that of using a single portable engine power source to drive multiple farm machines – only it doesn’t let the user disconnect any of the three machines it drives: the thresher, the reaper and the winnower. Instead, the combine keeps all three hidden beneath that smart exterior – so it’s essentially a tractor with three machines attached to it, protected from the elements and from moving part damage with an armoured box. The advantages of having your power source move with you, but of having it disconnected from the machines you use, are several. Importantly, it cuts down on the number of engines you have to rely on – meaning you can plough most of your resources into the purchase and maintenance of a single tractor as a power plant. The machines attached to the tractor have less internal mechanics as a result, and so are less likely to develop serious faults. Author Bio:Tom Brown is a freelance writer based in Denbighshire. He has researched agricultural machinery, farm machinery and the sector overall online. He enjoys spending time with his computer enjoying computer games.